Turkish security op, curfew in Kurdish areas puts 200,000 people at risk – Amnesty Intl. Turkey’s security operations in the mainly Kurdish southeast resemble ‘collective punishment’, and have risked the lives of some 200,000 people, placing residents in the crossfire and depriving them of water and electricity, Amnesty International said. The human rights watchdog refuted Ankara’s claims that the 24/7 curfew it imposed in areas where the government troops were fighting the armed Kurdistan Workers Party (PKK) units were aimed solely at protecting civilians. “Cuts to water and electricity supplies combined with the dangers of accessing food and medical care while under fire are having a devastating effect on residents, and the situation is likely to get worse, fast, if this isn’t addressed,” John Dalhuisen, Amnesty International’s Europe and Central Asia Program Director, said. “In some areas, crippling curfews that don’t allow people to leave their houses at all have been in place for more than a month, effectively laying siege to entire neighborhoods,” he added. 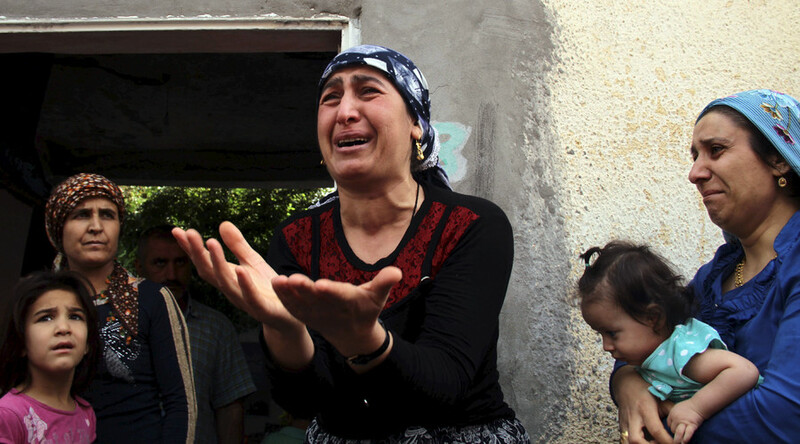 One Kurdish family said that they had to live under the same roof with the decomposing body of their dead relative for nearly two weeks due to the curfew, Amnesty International wrote on its website. 150 civilians as well as hundreds of troops on both sides were killed since Turkey launched its operation in the south-east in July 2014, according to the London-based watchdog. “Among those killed were young children, women and elderly people, who are very unlikely to have been involved in clashes with security forces,” Amnesty stressed. The Turkish operations in Diyarbakir, Cizre, Silopi and other Kurdish towns “are beginning to resemble collective punishment,” Dalhuisen said. Amnesty also blasted the international community for turning a blind eye to what Ankara has been doing with the Kurds. “While the Turkish authorities appear determined to silence internal criticism, they have faced very little from the international community. Strategic considerations relating to the conflict in Syria and determined efforts to enlist Turkey’s help in stemming the flow of refugees to Europe must not overshadow allegations of gross human rights violations. The international community must not look the other way,” Dalhuisen stressed. An unnamed senior Turkish official commented on the Amnesty International report, saying that "Turkey has never taken an approach that would endanger the lives of innocent citizens." "This is a struggle against a terrorist organization that harms everyone in the region and is responsible for the deaths of many people, primarily security forces," the official told Reuters. The current of violence in the Turkey southeast, where 15 million of the country’s Kurds reside, put an end to the ceasefire between the government and PKK. On Wednesday, President Tayyip Erdogan reaffirmed his unwillingness to search for a peaceful solution to the conflict, which began in 1984 and took 40,000 lives. "We don't have a road plan in front of us. Those with guns in their hands and those who support them will pay the price of treason," Erdogan said. 33 PKK militants were killed on Wednesday, while one soldier died and seven were wounded in Diyarbakir, the region's biggest city, the Turkish military said. Russia also urged Turkey to put an end to the policy of the “extermination” of its Kurdish population on Thursday. Russian Foreign Ministry spokeswoman, Maria Zakharova, said that Moscow supported the academics who signed a petition calling for an end to Ankara’s violent attacks against Kurds. “We can’t but support calls for the Turkish authorities outlined in this document to stop the extermination of the local population and the deliberate policy of resettling Kurds,” she said. A petition, entitled “We will not be party to this crime,” was signed by over 1,000 academics from nearly 90 Turkish and foreign universities last week. Turkish authorities responded to the petition by detaining some of the signees, with Erdogan denying any human rights violations and accusing the academics of siding with the Kurdish terrorists.